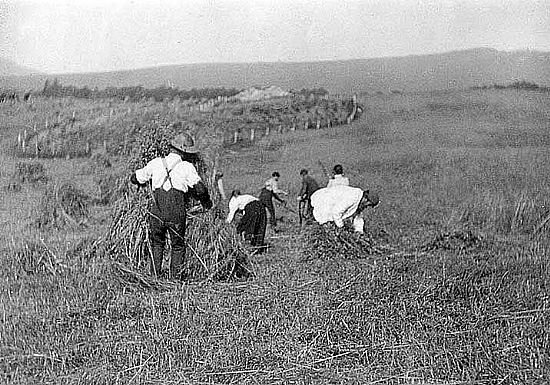 Prior to the mechanisation of farming, squads of workers were required to cut and gather ripened corn at harvest time (in Strathnairn oats was traditionally the common corn crop). The standing corn was cut with a scythe, as we see in the picture above. On larger farms, the scything operation would have involved a sizeable team of men.Cutting corn with a scythe was a highly skilled task and an expert "scyther" would cut with great rythm and precision (an amateur would be in great danger of seriously cutting himself with the very sharp blade). Following on behind the scythers would be another team of men, women and children whose task was to gather the corn into bundles (as we see above) and tie these around the middle (with strands of corn prior to the use of string) to form sheaves. Once the sheaves were bound, these would be gathered into "stooks" - a collection of around 6-10 sheaves formed into a tent shape in order to help them shed off the rain until it was time for the sheaves to be gathered and taken home to the stackyard at the home farm. After the arrival of mechanisation, the labour burden was greatly reduced by use of the tractor-drawn "binder". These machines would not only cut the corn but would also transform it into sheaves - all in one operation. Binders continued to be used in Strathnairn up until the 1970's.